Zoom Groom Dog Gentle rubbery fingers make grooming a pleasurable experience for your pet. Zoom Groom is easy to clean and suitable for both short and long haired breeds. The massaging action of the fingers is heaven for your pet, and the rubber texture removes loose hair like a magnet. 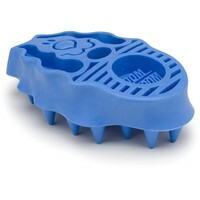 Zoom Groom can also be used to aid shampooing and rinsing as the rubbery brush will not be damaged by water. Brought this after seeing the vet use it. its GREAT! Works on my dobe and long hair cat. I've been having trouble finding a grooming product for short hair dog and i think i've found it. & of course vetuk does it cheapest. This product is sold as suitable for short haired breeds but I found it totally useless & uncomfortable for my two staffords' short coats. Having little hair to latch on to (their fur is only about 1-2cm long) it drags against their skin (even with the lightest pressure) & makes the whole process traumatic for them. It also fails to pick up loose hairs. I've now ditched this for a Miki grooming glove - the dogs are much happier & now enjoy being groomed again. I bought the zoom groom for my Staffy. It gets out all the dead hair really quickly, much better than a brush or comb. The only thing I'd add is, don't press too hard as you brush with this, as the rubber can pull the skin and hurt your dog.